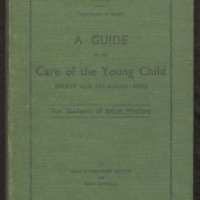 A Guide provides textbook material for Infant welfare nurses, who were at the forefront of the transference of knowledge to mothers about their children. From the research of Dr Scantlebury Brown, it was first published as ‘Guide to Infant Feeding’ in 1929. After the death of Brown in 1946, Dr Kate Campbell updated the content. The book covers all aspects of the growth and development of young children, incorporating food it into the process, whether it is breastfeeding, lunches or general nutrition problems. 251 pages : 2 illustrations ; 25 cm.